1Technological Educational Institute of Eastern Macedonia and Thrace, Department of Forestry and Management of Natural Environment, Laboratory of Wood and Wood Products, Drama, Greece. This study shows that it is feasible to make one-layer experimental particleboards from banana chips. Mechanical properties were easily satisfied at lower dosing rates, however thickness swelling remains a problem. The addition of 1% wax to the boards bonded with 14% resin resulted in improved thickness swelling and satisfied the EN 312 standard, but still it was not sufficiently low to satisfy the ANSI standard. It is suggested that combinations of banana chips with industrial wood chips, may be used in order to improve the thickness swelling of the particleboards. Also, the use of chemical modification of the banana chips with conventional urea formaldehyde resin may be an avenue for exploration in further investigations. Worldwide economic growth and development have generated unprecedented needs for converted forest products such as pulp and paper, composite boards, plywood and lumber (Youngquist et al. 1993). This global demand started with the advent of the industrial revolution resulting in aggressive deforestation and in an increase in the concentration of global carbon dioxide (Adger and Brown 1994). This “greenhouse effect” has influenced many processes now felt at various scales around the globe: increasing climatic variability, resulting in severe floods and droughts, advancing desertification, melting glaciers and permafrost and rising ocean levels. Forests now cover 3,6 billion hectares or approximately 27% of the world’s ice-free land area. Of the forested area, tropical forests cover 54%. According to the FAO (FAO 1999) the total stock of wood contained in these forests is estimated at about 315 billion m3. This is the resource base and it is being depleted at an estimated rate of 6 billion m3 annually. An option for increasing the wood supply, and therefore partially overcome some of the above problems, which has received a great deal of attention in recent decades, is establishment of vast areas of high-yield forest plantations. Currently, plantations forests comprise only about 4,2% of forests globally (up from 3,5% in 1995), but provide 22% of industrial wood, 4% of fuel wood, and 12% of annual wood production overall (FAO 1999, FAO 2000). Forest plantations were estimated to cover about 123,7 million ha globally in 1995, this had grown to 143 million ha by the 1999. The current rate of establishment of such plantations is fairly rapid resulting in 4,7 million ha/year (Bowyer and Stockman 2001). To tackle the aforementioned issues, ﬁnding alternatives for the relatively slow growing forest trees is critical. Abundantly available plants cultivated in agriculture might be good candidates, showing also anatomical and chemical structures suitable to produce panels (Balducci et al. 2008, Mati-Baouche et al. 2014, Papadopoulou et al. 2015). Research pertaining agriculture residues used in particleboard manufacturing has been shown in the literature. A number of plant materials with respect to particleboard production were studied, including stalks from sunﬂower (Binici et al. 2014, Mati-Baouche et al. 2014, vine (Yeniocak et al. 2014), topinambour stalks (Balducci et al. 2008, cotton stalks (Gansberger et al. 2015, Nazerian et al. 2016), coconut chips (Papadopoulos and Traboulay 2002), bamboo chips (Papadopoulos et al. 2004, De Araujo 2011a, De Melo and Stangerlin 2015), flax chips (Papadopoulos and Hague 2003). Past research addressing particleboard production using plants residues also include. rice straw (Li et al. 2010), wheat straw (Mo et al. 2003), canola straws (Kord et al. 2016), reed stem (Kord et al. 2015), date palms (Amirou et al. 2013), oil palms and opium poppy husks (Küçüktüvek et al. 2017), and cotton stalks (Guler and Ozen 2004). Balducci et al. (2008) introduced residues of several central European agricultural plants as raw materials for low-density particleboards and Papadopoulou et al. (2015) have shown light-weight sandwich particleboards made with shives and fibers from hemp. Banana plant is a renewable lignocellulosic raw material of the Musaceae family. The plant is allowed to produce two shoots at a time; a larger one for immediate fruiting and a smaller "sucker" or "follower" to produce fruit in 6-8 months. The life of a banana plantation is 25 years or longer, during which time the individual stools or planting sites may move slightly from their original positions as lateral rhizome formation dictates. This agricultural activity generates a large amount of residues, because each plant produces only one bunch of bananas, after its harvesting the bare pseudo-stems are cut and usually left in the soil plantation to be used as organic material. Thus, it could be estimated that few tons per hectare are produced annually. The banana plant has long been a source of fiber for high quality textiles. In Japan, banana cultivation for clothing and household use dates back to at least the 13th century. In the Japanese system, leaves and shoots are cut from the plant periodically to ensure softness. Harvested shoots are first boiled in lye to prepare fibers for yarn-making. These banana shoots produce fibers of varying degrees of softness, yielding yarns and textiles with differing qualities for specific uses. For example, the outermost fibers of the shoots are the coarsest, and are suitable for tablecloths, while the softest innermost fibers are desirable for kimono and kamishimo. This traditional Japanese cloth-making process requires many steps, all performed by hand. In a Nepalese system the trunk is harvested instead, and small pieces are subjected to a softening process, mechanical fiber extraction, bleaching and drying. After that, the fibers are sent to the Kathmandu Valley for use in rugs with a silk-like texture. These banana fiber rugs are woven by traditional Nepalese hand-knotting methods, and are sold RugMark certified. In South Indian state of Tamil Nadu after harvesting for fruit the trunk (outer layer of the shoot) is made into fine thread used in making of flower garlands instead of thread. Consequently, the purpose of this communication is to report results obtained in a study whose scope was to evaluate the technical feasibility of making one-layer experimental particleboards from banana chips - a neglected and novel source of a renewable lignocellulosic raw material of the Musaceae family. A banana plantation in Portugal provided the raw material used in this study. The banana (Musa acuminata.) stem chips were prepared from mature trees approximately 25 years old. The banana trees selected for making particleboard chips were generally 10-11 m in height while the stem diameter ranged between 20 and 40 cm. The stems were cut into slices (ca 20 cm long) and chipped in a hammer mill. For comparative reasons, wood chips were also used. Each furnish type was screened first through a mesh with 5 mm apertures to remove oversize particles (Figure 1a left) and then through a mesh with 1 mm apertures to remove undersize (dust) particles. After screening the chips were dried to 3% moisture content at 70ºC. After drying the bulk density of each furnish was determined. Samples of each furnish type were also further screened over a mesh with 3 mm apertures (Figure 1b); the dimensions of particles comprising the fractions retained on and passing through the 3 mm mesh were then determined. Figure 1 The raw material used in the study. Pre-weighed raw material was placed into a resin blending chamber equipped with a rotary arm agitator. A commercial E1 grade urea formaldehyde (UF) particleboard resin (62,4% solids content), containing 2% (based on resin solids) ammonium chloride as hardener, was used for the manufacture of boards. Alternatively, melamine urea formaldehyde (MUF) would be used instead of UF in order lower thickness swelling values to be obtained; however UF was preferred due to its lower cost. The amount of resin used was expressed as a percentage of the oven dry weight of wood. Where necessary, additional water was added to bring the furnish to the target moisture content level (10%); this was done after resin application. The total blending and mixing time was 3 minutes. Mattresses were hand-formed and hot pressed at 200ºC for 6 minutes using a maximum pressure of 3,4 MPa. Target board density was 750 kg/m3 and target board thickness 17,5 mm. Three replicate panels were produced for each board type. In the cases where wax (type E538, 60% solids content) was used in the particleboard manufacture, it was applied after the resin. The mat core temperature was measured during hot pressing using a 30-gauge type-K thermocouple. After manufacture the boards were conditioned at 20ºC and 60% relative humidity. Values for internal bond (IB), modulus of rupture (MOR) and thickness swelling (TS) after 24 hours water immersion were then determined according to procedures defined in the American standard for particleboards (ANSI A208.1-1998) and European Union standards EN 310, EN 317 and EN 319. When screened over the 3 mm mesh, approximately 30% of the banana furnish was retained on the mesh. This is in line with the results for the wood chip furnish, where less than a third was retained on the mesh and contrasted with previous results with bamboo and flax furnishes, where more than half of the bamboo and flax furnish was retained on the mesh (Papadopoulos et al. 2004, Papadopoulos and Hague 2003). The dimensions of banana and industrial wood chips and their length to thickness and length to width ratios are presented in Table 1. Banana particles had almost the same length, width and thickness with the wood chips. As a result, their length to thickness and length to width ratios were similar to those of the wood chips. In contrast, bamboo particles were typically longer, thinner and narrower than the wood chips. As a result, their length to thickness and length to width ratios were typically higher than those of the wood chips (Papadopoulos et al. 2004). The same behaviour was also observed with flax chips, however the differences in that case were more obvious (Papadopoulos and Hague 2003). The bulk density of the banana furnish was determined to be much lower than the wood chip furnish (Table 2) and close to the bulk density of the flax (Papadopoulos and Hague 2003). Table 1 Dimensions of bamboo and industrial wood chips. The values shown are means from 50 samples. Standard deviations in parentheses. Table 2 Bulk density (kg/m3) of banana and industrial wood chips. The values shown are means from 3 samples Standard deviations in parentheses. Figure 2 presents typical core temperatures in the banana particleboard mats and in particleboard mats made from industrial wood chips. It can be seen that the rate of heat transfer to the core was different in the two mats, being significantly slower in the banana panel. This is probably related to the lower bulk density of the banana furnish and consequent reductions in mat permeability upon densification during hot pressing. Similar behaviour was also observed by previous workers in particleboards made from coconut and flax residues (Papadopoulos and Hague 2003, Papadopoulos et al. 2002). Figure 2 Mattress core layer temperature during hot pressing of test panels Data for coconut, bamboo and flax boards (Papadopoulos et al. 2002, Papadopoulos and Hague 2003, Papadopoulos et al. 2004) included for comparison. The properties of the single layer experimental particleboards made from banana chips are shown in Table 3. From this, it can be seen that higher resin content levels resulted in improved board properties. When we look at the data in light of industry standards, we see that particleboards bonded with 14 % resin conformed to the more stringent requirements of class M-3, as far as the mechanical properties are concerned, while their TS values were far below the standards. However, the British P3 interior fitment board criteria were satisfied at a dosing rate of 12% UF. The P4 load-bearing panel, however, required 14% of resin to satisfy the mechanical properties, while the TS remained a problem, even when the resin was increased to 14%. It must be pointed out that no wax was used in the manufacturing of the boards. 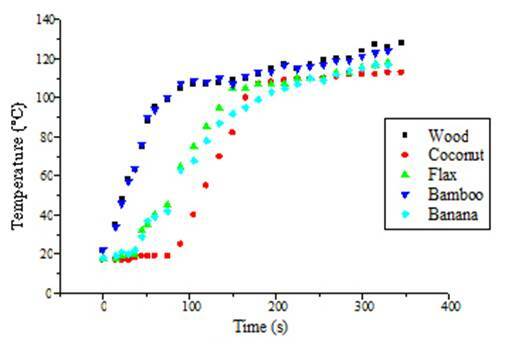 The addition of wax to reduce TS was investigated by adding 1 wax to the boards bonded with 12 and 14% resin, since these rates appeared to be promising in achieving the 8% and 14% TS value specified in the ANSI standard and in EN 312, for P4 load-bearing boards, respectively. The results are shown in Table 3. The addition of 1% wax to the boards bonded with 12% resin resulted in improved TS, however did not satisfied the EN 312 standard and it was not sufficiently low to satisfy the ANSI standard. The addition of 1% wax to the boards bonded with 14% resin resulted in improved TS and satisfied the EN 312 standard, but still it was not sufficiently low to satisfy the ANSI standard. However, no boards conformed to the more stringent requirements (8% TS), as specified in the ANSI standard. Table 3 Mean properties of UF-bonded single-layer experimental particleboards. Standard deviations in parentheses. Banana chips were characterised by having similar length to thickness and length to width ratios and lower bulk density than industrial wood particles. The rate of heat transfer to the core was approximately the same in the two mats, probably reflecting the same values of bulk density between banana and wood chips. This study shows that it is feasible to make one-layer experimental particleboards from banana chips. Mechanical properties were easily satisfied at lower dosing rates, however, TS remains a problem. The addition of 1% wax to the boards bonded with 14% resin resulted in improved TS and satisfied the EN 312 standard, but still, it was not sufficiently low to satisfy the ANSI standard. It is suggested that combinations of banana chips with industrial wood chips (50:50), may be used in order to improve the thickness swelling of the particleboards. Also, the use of a chemical modification of the banana chips with melamine urea formaldehyde resin may be an avenue for exploration in further investigations.